After a handful of free-scoring victories in the preceding weeks leading up to this titanic clash, Thomas Tuchel's Borussia Dortmund were a side on a mission, looking to make their mark on the continent with a result against the current 11-time winners. Zinedine Zidane's side were suffering from issues both on and off the field. A pair of frustrating draws in La Liga has cut their lead short to just a point while Cristiano Ronaldo had been in the news for all the wrong reasons following his premature substitution against Las Palmas on the weekend. The fans were certainly treated to a spectacle as soon as a ball was kicked. Ronaldo forced a brilliant save from Roman Burki in the Dortmund net before Keylor Navas had to match his opposite number with an equally outstanding stop to deny Gonzalo Castro at the other end. The breathless showed no signs of slowing down, and before long the 80,000 strong home contingent were roaring for a penalty, protests which were waved away by referee Mark Clattenburg. TV replays showed that Ronaldo had indeed appeared to handle the ball inside the box, much to the discontent of the vociferous yellow army inside the stadium. A quick break caught Dortmund napping at the back, and Karim Benzema found himself played clean through on goal, with only Burki to beat. Much to the delight of the crowd though, the Frenchman inexplicably slipped and fell flat on his face with no one within five yards of him! Dortmund were eventually made to rue missed opportunities though, as they conceded a sloppy on the break. A typical clinical move by Madrid on the counter, as Bale teed up Ronaldo with a terrific backheel nutmeg, before the Portuguese forward slammed his shot into the corner. This only fired up the Bundesliga outfit further though, as Ousmane Dembele's shot flew narrowly over the bar before Aubameyang rattled the woodwork after some good work by Matthias Ginter. 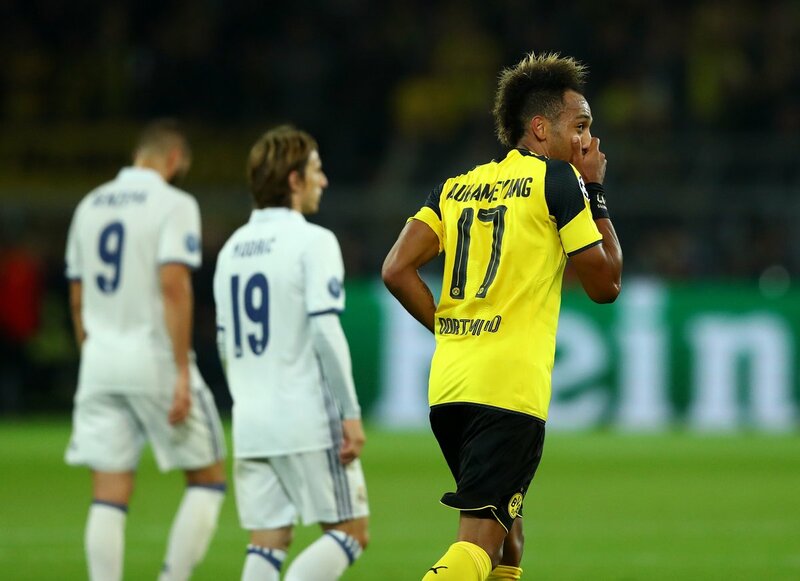 Dortmund continued to dominate as Madrid were unusually content to sit back and absorb the mounting pressure. And so it told, the timeliest of equalisers just before the break came in a bizarre sequence of events. Navas had an absolute nightmare, making a meal of a relatively straightforward save from a free-kick, punching it right back into the danger area under no pressure at all. A bounce off an unsuspecting Varane and back towards goal was enough to put the ball on a plate for Aubameyang on the line, as Tuchel's men deservedly drew level. Only offside denied Ronaldo from giving Madrid the lead again before half-time as both sides walked off the pitch for a deserved breather. The two goalscorers continued to pose a sizeable threat, as first Aubameyang's curled effort forced a flying save out of Navas before Ronaldo shockingly headed off target unmarked after peeling away from the pack at the back post. A thoroughly entertaining encounter between two of Europe's finest, expect to see them go far in this year's competition. It must be noted the sheer magnitude of Dortmund's control over the game against the finest team on the continent was something to behold, and a performance which could make the yellow and blacks a real contender for the crown this season.